It is easy to make yourself through scan. The artwork on your own. The price for one t-shirt is so cheap. Anyway, it is about 33 dollars?! what a rip off. No thanks. This is an officially lichened shirt. Proceeds return to Capcom directly. The more money the franchise earns the better. 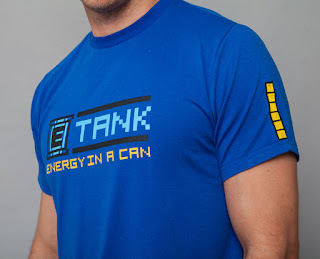 Okay...aren't they called E-Cans in classic and E-Tanks are the X Series items? Shirt's kinda cool though, I suppose. MacLemore's Thrift Shopping rant on shirts comes to mind.